For other uses, see Hopi (disambiguation). The name Hopi is a shortened form of their autonym, Hopituh Shi-nu-mu ("The Peaceful People" or "Peaceful Little Ones"). The Hopi Dictionary gives the primary meaning of the word "Hopi" as: "behaving one, one who is mannered, civilized, peaceable, polite, who adheres to the Hopi Way. In contrast to warring tribes that subsist on plunder." On December 16, 1882, President Chester A. Arthur passed an executive order creating a reservation for the Hopi. It was smaller than the surrounding land that was annexed by the Navajo reservation, which is the largest in the country. On October 24, 1936, the Hopi people ratified a Constitution. That Constitution created a unicameral government where all powers are vested in a Tribal Council. While there is an executive branch (tribal chairman and vice chairman) and judicial branch, their powers are limited under the Hopi Constitution. The traditional powers and authority of the Hopi Villages were preserved in the 1936 Constitution. Today, the Hopi Reservation is entirely surrounded by the much larger Navajo Reservation. The two nations used to share the Navajo–Hopi Joint Use Area, but this was a source of conflict. The partition of this area, commonly known as Big Mountain, by Acts of Congress in 1974 and 1996, has also resulted in long-term controversy. Old Oraibi is one of four original Hopi villages, and one of the oldest continuously inhabited villages within the territory of the United States. In the 1540s the village was recorded as having 1,500–3,000 residents. The first recorded European contact with the Hopi was by the Spanish in A.D 1540. Spanish General Francisco Vásquez de Coronado went to North America to explore the land. While at the Zuni villages, he learned of the Hopi tribe. Coronado dispatched Pedro de Tovar and other members of their party to find the Hopi villages. The Spanish wrote that the first Hopi village they visited was Awatovi. They noted that there were about 16,000 Hopi and Zuni people. A few years later, the Spanish explorer García López de Cárdenas investigated the Rio Grande and met the Hopi. They warmly entertained Cardenas and his men and directed him on his journey. In 1582–1583 the Hopi were visited by Antonio de Espejo’s expedition. He noted that there were five Hopi villages and around 12,000 Hopi people. During that period the Spanish explored and colonized the southwestern region of the New World, but never sent many forces or settlers to the Hopi country. Their visits to the Hopi were random and spread out over many years. Many times the visits were from military explorations. The Spanish colonized near the Rio Grande and, because the Hopi did not live near rivers that gave access to the Rio Grande, the Spanish never left any troops on their land. The Spanish were accompanied by missionaries, Catholic friars. Beginning in 1629, with the arrival of 30 friars in Hopi country, the Franciscan Period started. The Franciscans had missionaries assigned and built a church at Awatovi. Spanish Roman Catholic priests were only marginally successful in converting the Hopi and persecuted them in a draconian manner for adhering to Hopi religious practices. The Spanish occupiers in effect enslaved the Hopi populace, compelling them to endure forced labor and hand over goods and crops. Spanish oppression and attempts to convert the Hopi caused the Hopi over time to become increasingly intolerant towards their occupiers. The documentary record shows evidence of Spanish abuses. In 1655, a Franciscan priest by the name of Salvador de Guerra beat to death a Hopi man named Juan Cuna. As punishment, Guerra was removed from his post on the Hopi mesas and sent to Mexico City. In 1656, a young Hopi man by the name of Juan Suñi was sent to Santa Fe as an indentured servant because he impersonated the resident priest Alonso de Posada at Awatovi, an act believed to have been carried out in the spirit of Hopi clowning. During the period of Franciscan missionary presence (1629-1680), the only significant conversions took place at the pueblo of Awatovi. In the 1670s, the Rio Grande Pueblo Indians put forward the suggestion to revolt in 1680 and garnered Hopi support. The Pueblo Revolt was the first time that diverse Pueblo groups had worked in unison to drive out the Spanish colonists. In the Burning of Awatovi, Spanish soldiers, local Catholic Church missionaries, friars, and priests were all put to death, and the churches and mission buildings were dismantled stone by stone. It took two decades for the Spanish to reassert their control over the Rio Grande Pueblos but the Catholic Inquisition never made it back to Hopiland. In 1700, the Spanish friars had begun rebuilding a smaller church at Awatovi. During the winter of 1700–01, selected teams of men from the other Hopi villages sacked Awatovi at the request of the village chief, killed all the men of the village, and removed the women and children to other Hopi villages, then completely destroyed the village and burned it to the ground. Thereafter, despite intermittent attempts in the course of the 18th century, the Spanish failed subsequently to ever re-establish a presence in Hopi country. In 1849, James S. Calhoun was appointed official Indian agent of Indian Affairs for the Southwest Territory of the U.S. He had headquarters in Santa Fe and was responsible for all of the Indian residents of the area. The first formal meeting between the Hopi and the U.S government occurred in 1850 when seven Hopi leaders made the trip to Santa Fe to meet with Calhoun. They wanted the government to provide protection against the Navajo, an Apachean-language tribe, but distinct from other Apache. At this time, the Hopi leader was Nakwaiyamtewa. The US established Fort Defiance in 1851 in Arizona, and placed troops in Navajo country to deal with their threats to the Hopi. General James J. Carleton, with the assistance of Kit Carson, was assigned to travel through the area. They "captured" the Navajo natives and forced them to the fort. As a result of the Long Walk of the Navajo, the Hopi enjoyed a short period of peace. In 1847, Mormons settled in Utah and tried to convert the Indians to Mormonism. Jacob Hamblin, a Mormon missionary, first made a trip into Hopi country in 1858. He was on good terms with the Hopi Indians, and in 1875 an LDS Church was built on Hopi land. In 1875, the English trader Thomas Keam escorted Hopi leaders to meet President Chester A. Arthur in Washington D.C. Loololma, village chief of Oraibi at the time, was very impressed with Washington. In 1887, a federal boarding school was established at Keams Canyon for Hopi children. The Oraibi people did not support the school and refused to send their children 35 miles (56 km) from their villages. The Keams Canyon School was organized to teach the Hopi youth the ways of European-American civilization. It forced them to use English and give up their traditional ways. The children were made to abandon their tribal identity and completely take on European-American culture. Children were forced to give up their traditional names, clothing and language. Boys, who were also forced to cut their long hair, were taught European farming and carpentry skills. Girls were taught ironing, sewing and "civilized" dining. The school also reinforced European-American religions. The American Baptist Home Mission Society made students attend services every morning and religious teachings during the week. In 1890, Commissioner of Indian Affairs Thomas Jefferson Morgan arrived in Hopi country with other government officials to review the progress of the new school. Seeing that few students were enrolled, they returned with federal troops who threatened to arrest the Hopi parents who refused to send their children to school, with Morgan forcibly taking children to fill the school. Agriculture is an important part of Hopi culture, and their villages are spread out across the northern part of Arizona. The Hopi and the Navajo did not have a conception of land being bounded and divided. The Hopi people had settled in permanent villages, while the nomadic Navajo people moved around the four corners. Both lived on the land that their ancestors did. On December 16, 1882, President Chester A. Arthur passed an executive order creating a reservation for the Hopi. It was smaller than the Navajo reservation, which was the largest in the country. The Hopi reservation was originally a rectangle 55 by 70 miles (88.5 by 110 km) in the middle of the Navajo Reservation, with their village lands taking about half of the land. The reservation prevented encroachment by white settlers, but it did not protect the Hopis against the Navajos. The Hopi and the Navajo fought over land, and they had different models of sustainability, as the Navajo were sheepherders. Eventually the Hopi went before the Senate Committee of Interior and Insular Affairs to ask them to help provide a solution to the dispute. The tribes argued over approximately 1,800,000 acres (7,300 km2) of land in northern Arizona. In 1887 the U.S government passed the Dawes Allotment Act. The purpose was to divide up communal tribal land into individual allotments by household, to encourage a model of European-American style subsistence farming on individually owned family plots of 640 acres (2.6 km2) or less. The Department of Interior would declare remaining land "surplus" to the tribe's needs and make it available for purchase by U.S citizens. For the Hopi, the Act would destroy their ability to farm, their main means of income. The Bureau of Indian Affairs did not set up land allotments in the Southwest. 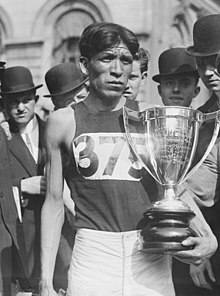 The chief of the Oraibi, Lololoma, enthusiastically supported Hopi education, but his people were divided on this issue. Most of the village was conservative and refused to allow their children to attend school. These natives were referred to as "hostiles" because they opposed the American government and its attempts to force assimilation. The rest of the Oraibi were called "friendlies" because of their acceptance of white people and culture. The "hostiles" refused to let their children attend school. In 1893, the Oraibi Day School was opened in the Oraibi village. Although the school was in the village, traditional parents still refused to allow their children to attend. In 1894, a group of Hopi parents announced that they were against the ideas of Washington and did not want their children to be exposed to the culture of white Americans. The government sent troops to arrest the 19 parents and sent them to Alcatraz Prison, where they stayed for a year. Another Oraibi leader, Lomahongyoma, competed with Lololoma for village leadership. In 1906 the village split after a conflict between hostiles and friendlies. The conservative hostiles left and formed a new village, known as Hotevilla. At the dawn of the 20th century, the US government established day schools, missions, farming bureaus, and clinics on every Indian reservation. This policy required that every reservation set up its own police force, tribal courts, and appoint a leader who would represent their tribe to the U.S government. In 1910 in the Census for Indians, the Hopi Tribe had a total of 2,000 members, which was the highest in 20 years. The Navajo at this time had 22,500 members and have consistently increased in population. During the early years of this century, only about three percent of Hopis lived off the reservation. In 1924 Congress officially declared Native Americans to be U.S citizens with the Indian Citizenship Act. Under the Indian Reorganization Act of 1934, the Hopi established a constitution to create their own tribal government, and in 1936 elected a Tribal Council. The Preamble to the Hopi constitution states that they are a self-governing tribe, focused on working together for peace and agreements between villages in order to preserve the "good things of Hopi life." The constitution consists of thirteen articles, addressing territory, membership, and organization of their government with legislative, executive and judicial branches. From the 1940s to the 1970s, the Navajo moved their villages ever closer to Hopi land, causing the Hopi to raise the issue with the U.S government. This resulted in the establishment of "District 6" which placed a boundary around the Hopi villages on the first, second, and third mesas, thinning the reservation to 501,501 acres (2,029.50 km2). In 1962 the courts issued the "Opinion, Findings of Fact and Conclusions of Law and Judgment," which stated that the U.S government did not grant the Navajo any type of permission to reside on the Hopi Reservation that was declared in 1882; and that the remaining Hopi land was to be shared with the Navajo. Between 1961–1964, the Hopi tribal council signed leases with the U.S government that allowed companies to explore and drill for oil, gas, and minerals in Hopi country. This drilling brought over three million dollars to the Hopi Tribe. In 1974, The Navajo-Hopi Land Settlement Act was passed. It created the Navajo-Hopi Indian Relocation Commission, which forced the relocation of any Hopi or Navajo living on the other's land. In 1992, the Hopi Reservation was increased to 1,500,000 acres (6,100 km2). Today's Hopi Reservation is traversed by Arizona State Route 264, a paved road that links the numerous Hopi villages. On October 24, 1936, the Hopi people ratified a constitution. That constitution created a unicameral government where all powers are vested in a Tribal Council. While there is an executive branch (tribal chairman and vice chairman) and judicial branch, their powers are limited under the Hopi Constitution. The traditional powers and authority of the Hopi villages was preserved in the 1936 constitution. The Hopi tribe is federally recognized and headquartered in Kykotsmovi, Arizona. First Mesa Consolidated Villages: Albert T. Sinquah, Wallace Youvella, Sr. Currently, the villages of Shungopavi, Oraibi, Hotevilla, and Lower Moenkopi do not have a representative on council. The Hopi Villages select council representatives, and may decline to send any representative. The declination has been approved by the Hopi Courts. The Hopi Tribal Government operates a Trial Court and Appellate Court in Keams Canyon. These courts operate under a Tribal Code, amended August 28, 2012. The Hopi tribe earns most of its income from natural resources. On the 1,800,000-acre (7,300 km2) Navajo Reservation, a significant amount of coal is mined yearly from which the Hopi Tribe shares mineral royalty income. Peabody Western Coal Company is one of the largest coal operations on Hopi land, with long-time permits for continued mining. The tribe's 2010 operating budget was $21.8 million, and projected mining revenues for 2010 were $12.8 million. Tourism is a source of income. The Moenkopi Developers Corporation, a non-profit entity owned by the Upper village of Moenkopi, opened the 100-room Moenkopi Legacy Inn and Suites in Moenkopi, Arizona, near Tuba City, Arizona. It is the second hotel on the reservation. It provides non-Hopi a venue for entertainment, lectures, and educational demonstrations, as well as tours and lodging. The project is expected to support 400 jobs. The village also operates the Tuvvi Travel Center in Moenkopi. The Tribally owned and operated Hopi Cultural Center on Second Mesa includes gift shops, museums, a hotel, and a restaurant that serves Hopi dishes. The Hopi people have repeatedly voted against gambling casinos as an economic opportunity. On November 30, 2017 in his last day as Chairman of the Hopi Tribe, Herman G. Honanie and Governor Doug Ducey signed the Hopi Tribe-State of Arizona Tribal Gaming Compact, a year after the Tribe approved entering into a compact with the State of Arizona. The historic agreement, which gives the Hopi Tribe the opportunity to operate or lease up to 900 Class III gaming machines, makes Hopi the 22nd and last Arizona tribe to sign a gaming compact with the State. Traditionally, Hopi are organized into matrilineal clans. When a man marries, the children from the relationship are members of his wife's clan. These clan organizations extend across all villages. Children are named by the women of the father's clan. On the twentieth day of a baby's life, the women of the paternal clan gather, each woman bringing a name and a gift for the child. In some cases where many relatives would attend, a child could be given over forty names, for example. The child's parents generally decide the name to be used from these names. Current practice is to either use a non-Hopi or English name or the parent's chosen Hopi name. 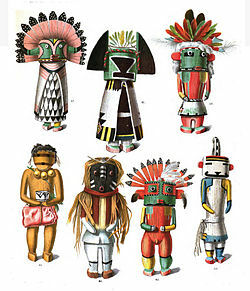 A person may also change the name upon initiation into one of the religious societies, such as the Kachina society, or with a major life event. The Hopi practice a complete cycle of traditional ceremonies although not all villages retain or had the complete ceremonial cycle. These ceremonies take place according to the lunar calendar and are observed in each of the Hopi villages. Like other Native American groups, the Hopi have been influenced by Christianity and the missionary work of several Christian denominations. Few have converted enough to Christianity to drop their traditional religious practices. Traditionally the Hopi are micro or subsistence farmers. The Hopi also are part of the wider cash economy; a significant number of Hopi have mainstream jobs; others earn a living by creating Hopi art, notably the carving of Kachina dolls, the crafting of earthenware ceramics, and the design and production of fine jewelry, especially sterling silver. The Hopi collect and dry a native perennial plant called Thelesperma megapotamicum, known by the common name Hopi tea, and use it to make an herbal tea, as a medicinal remedy and a yellow dye. The Hopi have a high rate of albinism—about 1 in 200 individuals. ^ "Ancestral Pueblo culture." Encyclopædia Britannica. Retrieved 4 June 2012. ^ a b "Hopi". Ausbcomp.com. Retrieved 2013-02-17. ^ a b c d e f g h i j Whiteley, Peter M. Deliberate Acts, Tucson, AZ: The University of Arizona Press, 1988: 14–86. ^ a b Justin B. Richland, Arguing With Tradition, (University of Chicago Press, 2004) 35. ^ "Short History of Big Mountain – Black Mesa". ^ "Navajo – Hopi Long Land Dispute". ^ "The Navajo-Hopi Land Issue: A Chronology". Archived from the original on 2008-05-30. ^ a b c d e Brew, J.O. "Hopi Prehistory and History to 1850." In Alonso Ortiz, vol. ed., Southwest, vol. 9, in William C. Sturtevant, gnl. ed., Handbook of North American Indians, Washington, D.C.: Smithsonian Institution, 1979: 514–523. ^ a b c d Clemmer, Richard O. Roads in the Sky, Boulder, Colorado. : Westview Press, Inc., 1995: 30–90. ^ a b c d e f Dockstader, Frederick J. "Hopi History, 1850–1940." In Alonso Ortiz, vol. ed., Southwest, vol. 9, in William C. Sturtevant, gnl. ed., Handbook of North American Indians. Washington, D.C.: Smithsonian Institution, 1979: 524–532. ^ Adams, David Wallace. "Schooling the Hopi: Federal Indian Policy Writ Small, 1887–1917", The Pacific Historical Review, Vol. 48, No. 3. University of California Press, (1979): 335–356. ^ a b Johansson, S. Ryan., and Preston, S.H. "Tribal Demography: The Hopi and Navaho Populations as Seen through Manuscripts from the 1900 U.S Census", Social Science History, Vol. 3, No. 1. Duke University Press, (1978): 1–33. ^ United States Congress, Senate, Committee on Interior and Insular Affairs. Navajo-Hopi Land Dispute: Hearing before the Committee on Interior and Insular Affairs, 1974, Washington DC: U.S Government Printing Office, (1974): 1–3. ^ a b Hopi Education Endowment Fund Archived 2009-10-11 at the Wayback Machine. Accessed: November 13, 2009. ^ Talayesva, Don. C. (1970). Sun Chief: The Autobiography of a Hopi Indian (2nd ed.). New Haven, CT: Yale University Press. p. 93. ISBN 978-0-300-19103-5. ^ "Constitution of the Hopi Tribe", National Tribal Justice Resource Center's Tribal Codes and Constitutions. November 28, 2009. ^ a b Hopi Cultural Preservation Office. http://www.nau.edu/~hcpo-p/. November 12, 2009. ^ Clemmer, Richard O. "Hopi History, 1940–1974." In Alonso Ortiz, vol. ed., Southwest, vol. 9, in William C. Sturtevant, gen. ed., Handbook of North American Indians. Washington, D.C.: Smithsonian Institution, 1979: 533–538. ^ a b c "Tribal Government". The Hopi Tribe. ^ Berry, Carol (14 January 2009). "Coal permit expansion approved as Hopi chairman resigns". Indiancountrytoday.com. Retrieved 14 November 2010. ^ Berry, Carol (13 January 2010). "Hopi Tribal Council's new structure irks some critics". Indiancountrytoday.com. Retrieved 14 November 2010. ^ May, Tina (6 January 2010). "Hopi Economic Development Corp. Transition Team Off to a Fast Start". Hopi-nsn.gov. Archived from the original on 4 May 2011. Retrieved 14 November 2010. ^ "New Hopi Hotel near Tuba City is Now Open!". Experiencehopi.com. Retrieved 14 November 2010. ^ Fonseca, Felicia. (9 December 2009). "Hopi hotel showcases Arizona tribe's culture". Indiancountrytoday.com. Retrieved 14 November 2010. ^ "Tuvvi Travel Center". Experiencehopi.com. Archived from the original on 6 June 2011. Retrieved 14 November 2010. ^ "Hopi Cultural Center". Hopi Cultural Center. Retrieved 20 January 2017. ^ Helms, Kathy (20 May 2004). "Hopi again vote down gambling". Gallup Independent. Archived from the original on 12 August 2011. Retrieved 14 November 2010. ^ "Medicinal Plants of the Southwest Thelesperma megapotamicum". New Mexico State University. Archived from the original on 9 May 2008. Retrieved 26 February 2014. ^ Hedrick, Philip (June 2003). "Hopi Indians, "cultural" selection, and albinism". American Journal of Physical Anthropology. 121 (2): 151–156. doi:10.1002/ajpa.10180. PMID 12740958. ^ Masayesva, Victor. Hopi Photographers, Hopi Images. Tucson, AZ: Sun Tracks & University of Arizona Press, 1983: 42. ISBN 978-0-8165-0809-9. Adams, David Wallace. "Schooling the Hopi: Federal Indian Policy Writ Small, 1887–1917." The Pacific Historical Review, Vol. 48, No. 3. University of California Press, (1979): 335–356. Brew, J.O. "Hopi Prehistory and History to 1850." In Alonso Ortiz, vol. ed., Southwest, vol. 9, in William C. Sturtevant, gnl. ed., Handbook of North American Indians. Washington, D.C.: Smithsonian Institution, 1979: 514–523. Clemmer, Richard O. "Hopi History, 1940–1974." In Alonso Ortiz, vol. ed., Southwest, vol. 9, in William C. Sturtevant, gnl. ed., Handbook of North American Indians. Washington, D.C.: Smithsonian Institution, 1979: 533–538. Clemmer, Richard O. "Roads in the Sky." Boulder, Colorado. : Westview Press, Inc., 1995: 30–90. "Constitution of the Hopi Tribe. National Tribal Justice Resource Center's Tribal Codes and Constitutions". Tribalresourcecenter.org. November 13, 2009. Dockstader, Frederick J. "Hopi History, 1850–1940." In Alonso Ortiz, vol. ed., Southwest, vol. 9, in William C. Sturtevant, gnl. ed., Handbook of North American Indians. Washington, D.C.: Smithsonian Institution, 1979: 524–532. "Hopi Cultural Preservation Office". Nau.edu. November 12, 2009. "Partners". Hopi Education Endowment Fund. November 13, 2009. Archived from the original on October 11, 2009. Johansson, S. Ryan., and Preston, S.H. "Tribal Demography: The Hopi and Navaho Populations as Seen through Manuscripts from the 1900 U.S Census." Social Science History, Vol. 3, No. 1. Duke University Press, (1978): 1–33. U.S Department of State, Navajo-Hopi Land Dispute: Hearing before the Committee on Interior and Insular Affairs, 1974. Washington DC: U.S Government Printing Office, (1974): 1–3. Whiteley, Peter M. "Deliberate Acts." Tucson, Arizona: The University of Arizona Press, 1988.: 14–86. Glenn, Edna; Wunder, John R.; Rollings, Willard Hughes; et al., eds. (2008). Hopi Nation: Essays on Indigenous Art, Culture, History, and Law (Ebook ed.). digitalcommons.unl.edu. Alfonso Ortiz, ed. Handbook of North American Indians, vol. 9, Southwest. Washington: Smithsonian Institution, 1979. ISBN 0-16-004577-0. Wikimedia Commons has media related to Hopi. Herbermann, Charles, ed. (1913). "Hopi Indians". Catholic Encyclopedia. New York: Robert Appleton Company.